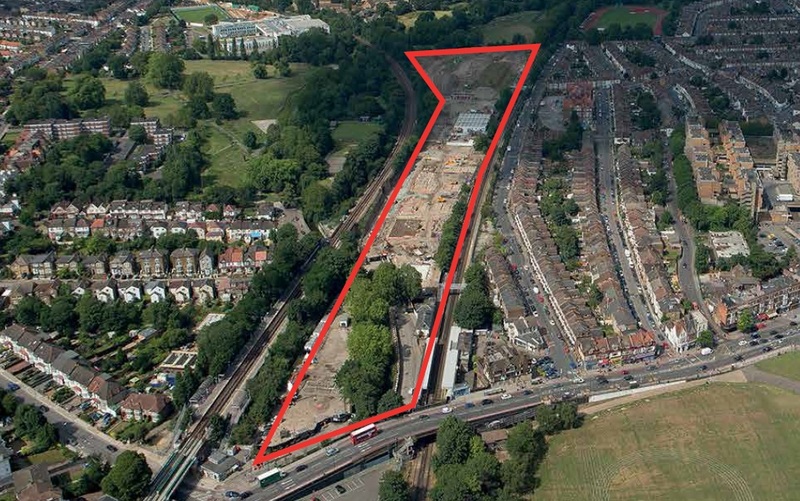 Catford Green housing development, located between Catford’s two stations, will potentially see a new tower under revised plans from Barratt Homes. The existing scheme, approved in 2009, includes 589 homes in 13 mid-rise blocks. Stage 1 has now almost completed and will be occupied soon. Like many Barratt developments, they seem to have found some of the dreariest colours imaginable for the facades and detailing. As I continually point out, increases in homes must be matched by better transport. The location is perfect, less than a minute walk from the tower to two stations, but it will add to strong passenger growth. Catford Bridge saw passenger numbers up 7% on the year in 2013/14, and Catford was up 12%. There is an easy way to accommodate growth on Southeastern lines, who run through Catford Bridge, and that is to go for 12-car running with additional trains. The line through Catford Bridge was supposed to have 12-car trains by the early 1990s. It never happened due to cuts and privatisation, and to now provide additional trains the Department for Transport and the Treasury must agree to it. Catford station is served by Thameslink. It only sees two trains an hour and I believe that doesn’t increase even after 2018 and Thameslink improvement work, which adds many more services for south and north London. The lack of additional train paths means much growth in passenger numbers will have to be accommodated on Southeastern’s line, as going 12-car is much easier and cheaper than extra services through Thameslink. Barratts are also proposing some smaller changes at the north of the development, facing onto Ladywell Fields. This plan is just one of many in Catford. 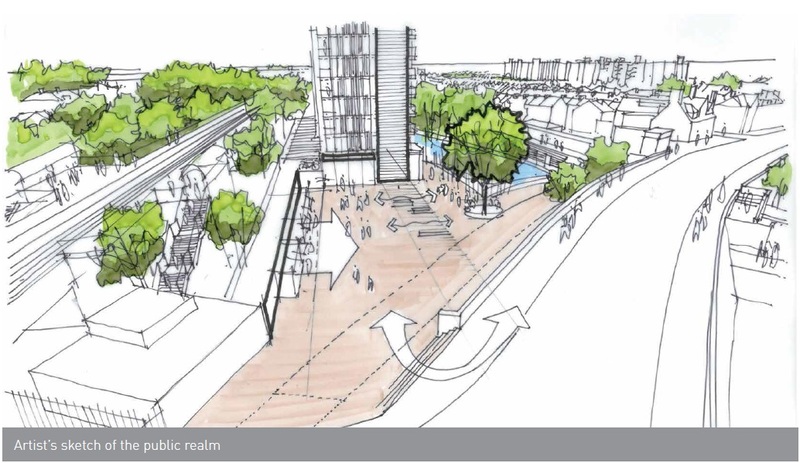 Lewisham Council hope to replace Wickes and Halfords big sheds opposite the planned tower and stations. This is a much needed step. Lewisham council are moving away from the wasteful model of giant sheds and car parking towards mixed-use and residential components, like much of London, whilst Greenwich council actively encourages big barns in inner London. 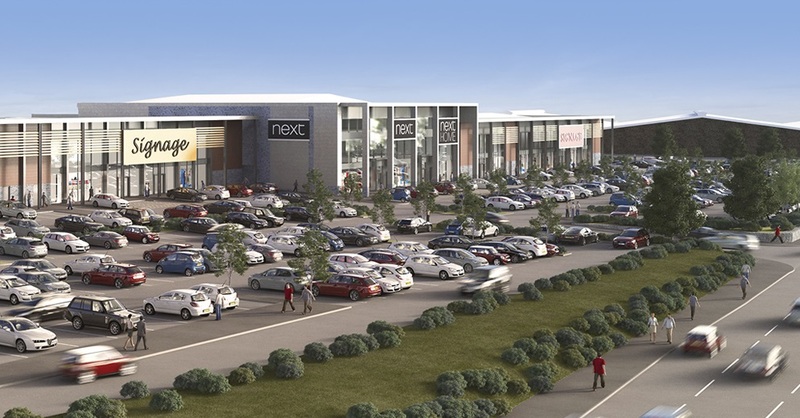 At next weeks planning meeting developers LXB, behind the forthcoming Brocklebank retail park in Charlton are proposing an increase of 30 parking spaces in the next stage of the estate, from 252 to 282 spaces. The parking spaces are naturally located beside the road and bus stops, so anyone arriving by bus or train has to walk through the car park to reach the shops. Other plans in Catford see a complete reworking of the crap one-way system and civic offices. This is a long running drama and isn’t imminent. The post-war, prefab Excalibur housing estate is also seeing demolition and replacement. 186 prefabs will become 371 new homes under the London and Quadrant scheme. I’m an infrequent visitor to the area but I don’t see too much wrong in theory with tall buildings at Catford Green providing the design is good, yet the renders don’t exactly promise that. London’s huge housing shortage isn’t going away. The retail park site over the road could also see tall buildings given its location next to a railway line, and potential for light loss and visual intrusion seems minimal if towers are well positioned. Locals may have other opinions there, as I’m not too familiar with the area. Catford isn’t an area I’ve covered much in the past, but will keep a close eye on in future. Getting more trains through Catford station would be difficult as the Catford Loop forms one of two 2-track lines from Bromley South into London (principally Victoria but also Blackfriars). As such it takes a large number of “fast” trains from Kent that would be held up by stopping trains. This chunk of South/SE London suffers from not having a 4-track line like the Brighton Main Line so that a total separation of fast and slow trains could be practical. As for Catford Bridge on the Hayes line, there I can only see frequency/capacity improvements if the Bakerloo extension goes ahead. Yep – the sooner existing services can all go 12 car on the Southeastern Hayes line the better. All down the the govt, who seem in no rush. More trains per hour is unlikely for many years so longer trains have to be provided. just to say there are far more than 2 trains per hour to Blackfriars from Catters in the morning peak. I agree the retail shed site across the road is a waste, and its awkward vehicle access only adds to the miserable road congestion around the two stations. Its hard to see how the junction by Catford station can cope with all the new traffic from the Catford Green scheme. I don’t see the Hayes line getting longer trains and platforms while the GLA/TFL are instead talking about it being taken over by a Bakerloo extension. instead. Waiting for a Bakerloo extension would be pushing it. The earliest planned date is 2030. This development will be fully built before then, as will various others in Catford, and one station along at Lower Sydenham there is a 500+ home scheme now in for planning at the Rylan factory site and surrounding area. The line already has platforms for 12-cars. It would only need longer trains, which would hopefully be sufficient up to any Bakerloo extension in 15 years. More stock moving to the network would free up carriages to move to the Hayes line. Regarding trains in the morning peak, you’re right. I checked nationalrail and they had trains in the peak from 7am at 07:26, 07:53, 08:08 then three quite close together. Still pretty limited for inner London with only a decent frequency from 07:53 for about an hour, but as said above, doing much more would impact longer distance trains given the limited infrastructure. Given all the options, if Thameslink can’t provide more trains from 2018 then 12-car on Southeastern looks by far the easiest and cheapest to achieve, if the DfT will approve it.